Peaches are such a versitile fruit. You can make them sweet or savory, in salads, cobblers or as the star of the meal. My favorite is making homemade peach butter. It’s perfect for spreading on toast, biscuits or even as an ice cream topping. It’s easy to preserve as well by water bath canning. So, here’s how to make and can homemade peach butter. This is a spiced peach butter recipe, but you can also leave the spices out if you desire. The result will still be delicious. a crockpot or oven, with an oven safe dish. First, to make the spiced peach butter, you will peel, pit and slice up the peaches. You can also make peach butter with skins on, but for a great way to use those skins for jelly, read the post here. Layer the peaches in a crockpot, filling to the top. Pour 2 cups of the sugar over the top of the peaches. Add in 1/2 of the remaining spices and stir gently. Cook on low for 3-4 hours in the crock pot or at 200 degrees in the oven. As the peach butter is cooking, you will want to stir it on occasion. This is only to help keep the peaches evenly cooking. After 4 hours, add the remaining sugar and spices and allow to continue cooking for another 3-4 hours. The peach butter will be rather runny at this point, but cooking it longer will allow it to thicken up. If you are using a crock pot, try setting the lid off a bit so some of the steam can escape. Open the oven door a bit as well if you can to allow the steam to escape. Your home will smell marvelous! Once the peach butter is as thick as you like it, usually after 8-10 hours, you can preserve it as is. If you like it a bit smoother, simply use a handheld blender and blend it smooth. Don’t have fresh peaches? 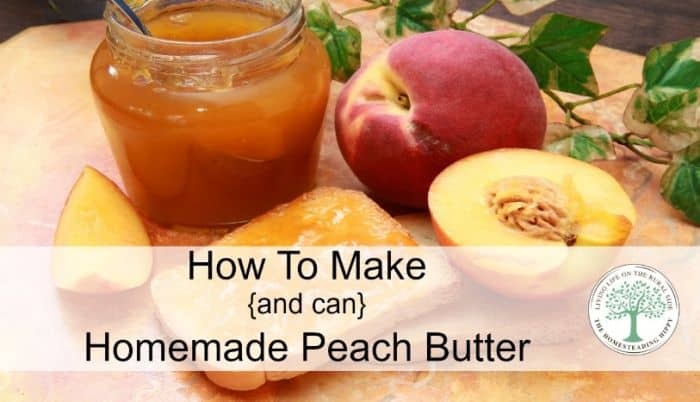 Use this peach butter recipe using canned peaches and get a great result as well. Pour the peach butter into clean and sterilized jars. Wipe the lid gently with a damp cloth to remove any food residue and add the new lid. Screw the band on finger tight. Process in a hot water bath for 25 minutes, timing once the water reaches it’s full boil. Remove jars from boiling water. Allow to cool in a non drafty place for 12 hours and test the lids. Remove the bands, wipe the jars and store for up to 1 year. Have you ever made peach butter? What is your favorite way to eat it? Be sure to pin this for later! Instead of canning, can i feeeze in mason jars? yes honey instead of sugar is fine. and YES, you can freeze in mason jars. Up to 6 months, then the flavor seems to fade. i don’t see why you couldn’t. How many pints did you get out of a batch?